It’s fils cadet‘s birthday today. After recovering from the shock of my baby turning three, we’ve been enjoying working our way through his new stash of books and jigsaws. One of the biggest hits so far has been 10 Little Penguins by Joëlle Jolivet and Jean-Luc Fromental, translated from French by Amanda Katz. Having come across it when writing about their previous book 365 Penguins I then promptly forgot about it until I spotted a copy on a friend’s bookcase recently. Fils cadet was rather taken with it, so we added it to his birthday list. 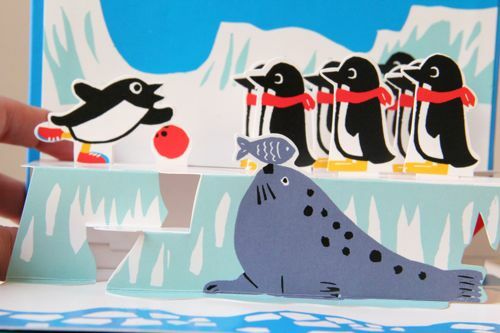 It’s a very lovely pop-up book in which, as the name suggests, ten little penguins disappear one by one. As it is unburdened by issues of plot, my inner pedant can happily ignore the anthropomorphised antarctic birds sledging or cooking in igloos, and just enjoy the gloriously bright and cheerful illustrations. Admittedly, the penguins do appear to meet a series of grisly ends, so it might not be ideal for the most sensitive of children. Both our boys, though – who can be upset by the strangest of things – were particularly keen on the one who ate so much krill he burst. And there was much giggling and shouting of “Bang!”. They do all return happily ever after at the end, so presumably it wasn’t a fatal explosion… The translator Amanda Katz has done a great job with the rhymes and succeeded in making the text scan as well (another bugbear of mine!) and I’m really pleased that she gets a credit this time. The paper seems robust and the pop-up pages mostly well engineered, although how much rough handling it will stand remains to be seen – it will join the ranks of books kept out of reach for the time being, for its own safety. Sadly, one of the penguins was stuck down when the book arrived, having been caught in the glue. I was able to free it, but some of the top layer of paper came off. That aside, this is a hugely enjoyable book and highly recommended. This entry was posted in Books, Children's Books, Reading, Reviews, Translation and tagged 10 Little Penguins, books, children's books, French books, Fromental, funny books, illustration, Jolivet, Penguin, picture books, pop-up books, recommendations, translation. Bookmark the permalink. Many happy returns to fils cadet.